Need an experienced captain to navigate? If you own your own boat and are not familiar with the complex Venice, Louisiana, area, or you just want to learn about the techniques and locations we use to catch fish, Captain Jonathan Ruffin is available for hire as a private captain. Venice can be a dangerous place to navigate and it’s important to be familiar with the waters. Also, yellowfin tuna in our area move around a lot so it is important to stay on top of the fish by being on the water often. 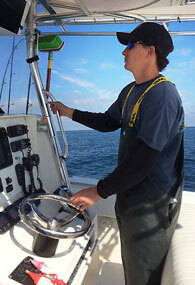 There is a major learning curve involved in offshore fishing, therefore hiring an experienced captain can be very beneficial to a private boat, making the most of an offshore trip. The customer must provide a well maintained and well equipped offshore capable boat, as well as the ice, bait and fuel. The captain will provide tackle if needed. The rate for a full day with Captain Jonathan is $500.